A new paper by researchers at the University of Notre Dame provides new insights into speciation, which is the evolutionary process by which new biological species arise. The research team, which was headed by Scott P. Egan, a research assistant professor with the Advanced Diagnostics and Therapeutics Initiative, and included Glen R. Hood, Gabriel DeVela and James R. Ott, investigated a special case of speciation, known as “ecological speciation,” in which new species arise as a result of populations adapting to different environments. “We do this using a peculiar group of plant-feeding insects called gall wasps, which induce cancer-like tissue growths on their host plants, within which the wasps live, feed and grow,” Egan said. 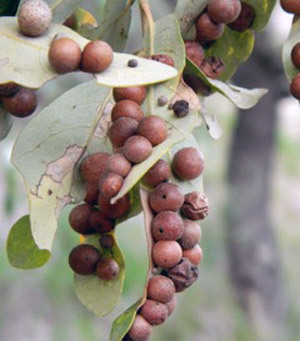 The researchers compared populations of two different species of these gall wasps that each inhabit the same two environments: the sand live oak and the southern live oak. The two oak species differ in many ways, and the populations of gall wasps feeding on each oak species may therefore experience different environmental challenges, which can result in selection for different traits due to natural selection. He points out that the persistent differences the researchers found in morphology and behavior among populations of both species highlight the important role of host plant use in promoting the reproductive isolation and speciation among herbivorous insect populations, which is one of the most species-rich groups of organisms on Earth. The new paper appears in the journal PLOS ONE. The Egan group previously published two papers in the journals Biology Letters and the International Journal of Ecology on ecological speciation using one of the two species studied in the new paper. The previous papers addressed the evolution reproductive isolation in just one species associated with adaptation to different host plants. The present paper expands on this work by testing two species across the same environmental difference. The two species tested in the present study are two of eight species that form host-associated populations of these two live oak species across the southeastern United States. The researchers are also interested in the genetic basis of adaptation to different environments and how this contributes to the speciation process. DeVela is a Notre Dame senior who contributed to the research described in the paper. “My participation in the paper started as an independent project guided by Dr. Egan and doctoral candidate Glen Hood in which I had samples of gall wasps from various locations in the South and Southeast,” he said. He plans on a career in medicine and is currently finishing up the medical school application process.